Wakefield Town Hall is located at 1 Lafayette Street, Wakefield, MA 01880; phone: 781-246-6389. 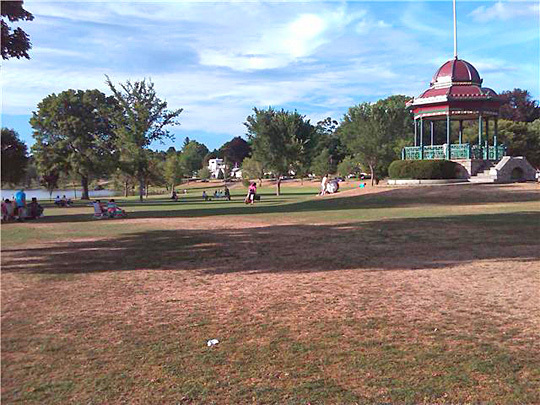 Photo: Wakefield Town Common, photographed by user:RedSoxFan274, 2010, en.wikipedia.org, accessed May, 2011. What is now Wakefield was part of the large, old town of Reading (spelled Redding in the 17th century), established in 1644 from the western part of Lynn (1638) and Lynn Village (1639) land grants, which covered much of the area of the present towns of Wakefield and Reading. A 1651 grant to Reading included most of the present town of North Reading. Another addition came in 1729, when the Greenwood section was annexed from Malden. In 1812, the southern, First Precinct of Reading separated from the rest of the town and incorporated as the new town of South Reading. In 1868, the name of South Reading was changed to Wakefield, in honor of Cyrus Wakefield, the leading local industrialist, and a major benefactor of the town. A portion of land was annexed from Stoneham in 1889, and minor boundary adjustments with Melrose and Saugus took place during the 20th century. The first permanent European colonial settlement of the area that is now Wakefield occurred in 1639. Aboriginal occupation had preceded the coming of the colonials, and native settlements were located in the surrounds of Lake Quannapowitt and Crystal Lake, and the Montrose section of Wakefield to the east. In 1639, the General Court of Massachusetts Bay granted twenty nine inhabitants. There is evidence for a local agricultural economy that was sustained by extensive cattle raising for the Boston and Salem markets, and by the production of grains. Local streams were quickly tapped for small-scale waterpower sites. As early as 1650, John Poole operated a gristmill on the Mill River, which originates at Crystal Lake. Early on, local craft production supplemented agricultural pursuits. In 1677, Jonas Eaton was given wood rights in the town on the condition that he remain there to make shoes, an activity that a century later had become an important local industry. Twenty-eight years after the first settlers arrived in 1667, there were fifteen houses in Reading. Most were probably small, one or two-room gable-roofed structures. In 1671, a garrison house, of unknown dimensions, was built to guard against Indian attacks. In 1812, a split occurred between the largely Federalist North and West parishes of Reading and the Republican South Parish. The more populated North and West parishes retained the name of Reading, while the South Parish separated as South Reading, establishing the basic boundaries of the area that would later be renamed Wakefield. Population growth continued at a steady pace. Population of the new town of South Reading in 1820 was approximately 1,000. By 1830 it had reached 1,311, and in 1840 it was 1,517. Outside the central village, the town continued to be characterized by dispersed farmsteads, with the most densely occupied rural neighborhood probably Salem Street as it approached the Saugus River crossing. Surviving period dwellings include the substantial two-story houses of the town's most successful farmers, who were prospering from dairy production for nearby urban markets. The arrival in Wakefield of the Boston and Maine Railroad in 1844-1845 was the catalyst for significant changes in almost every aspect of the community. This branch of the Boston and Maine line was located through Malden, South Reading, and Reading to Wilmington, where it connected with a line to Haverhill and the north. The addition of branch lines made South Reading an important junction point in the regional rail network. From 1873 to 1905, Wakefield experienced considerable industrial growth and suburban development. Rapid population growth continued, as the number of inhabitants doubled during the period. The introduction of electric street railway service provided a new set of cheap and convenient transportation routes. All these trends led to a tremendous growth in the size of the housing stock, built to accommodate an increasing number of suburban commuters and local factory workers. Between 1870 and 1880, Wakefield's population increased by over 1,400, with the number of residents reaching 5,547. By 1890, the population had reached 7,000, and by 1905 it had topped 10,000, as both Boston commuters and local employees relocated to the town. At the end of the period, 26% of the population was foreign born, with half of this group immigrants from Ireland and Nova Scotia, and smaller numbers from Canada, England, Sweden, and Italy. Electric street railway service was established in 1892 with the opening of the Wakefield and Stoneham Street Railway Company. Early streetcar lines extended along Main, Albion, and Water Streets. Service to Woburn and Winchester was soon followed by the extension of lines to Melrose (1893), Reading (1894), and Saugus. In 1898, service was extended to Peabody and Salem, and in 1902 a branch line was opened to Wakefield Park. The new lines extended the distance that Wakefield commuters could live from local railroad depots, and from workplaces in Wakefield and nearby towns, and helped generate a new round of local suburban development. The importance of Wakefield as a diversified industrial town, a regional commercial center, and an affluent Boston suburb stimulated growth through the 1920s, although the town population stabilized during the depression years of the 1930s. The number of inhabitants rose from 10,268 in 1905 to 16,318 in 1930, falling slightly to 16,223 in 1940. Street railways continued to operate to ca. 1920, when they were replaced by bus service and the increasing use of the automobile. Commuter rail service to Boston continued to play an important role for Wakefield suburbanites. By the end of the period, the town was also served by two regional automobile highways, both of which routed traffic through Wakefield Center. The majority of the housing stock in Wakefield was constructed between 1880 and 1930, although new, suburban tract housing was built in the post-World War II era. Wakefield's diversity of residential architecture includes scattered pre-1850 farmhouses, streetscapes and clusters of mid 19th-century houses, and more recent subdivisions. Single-family, wood-frame dwellings predominate, followed by two-family houses. Larger multi-family houses are much less numerous, although some wood-frame and masonry apartment blocks were built. Broadly speaking, Wakefield's residential areas are geographically distributed as follows: neighborhoods of large, single-family, mid-19th to early-20th century houses on the hills west and north of the town center; more modest single and multi-family houses to the southwest and southeast; and a distinct area of late 19th to mid 20th century, single family houses to the south at Greenwood. Carol Huggins and Betsy Friedberg, Massachusetts Historical Commission, Wakefield Multiple Resource Area, nomination document, 1989, National Park Service, National Register of Historic Places, Washington, D.C.